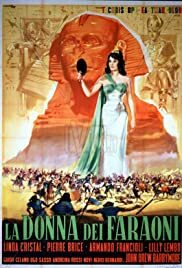 An earnest and largely successful attempt to portray life in ancient Egypt through the story of an ambitious woman who aggressively hooks up with three young nobles by swimming out to their pleasure barge on the Nile river, rather like an eager groupie going along for a joy ride. Eventually, the rival lords (Barrymore and Francioli) each become a pharaoh, one of upper and one of lower Egypt. The girl (Linda Cristal) becomes a queen but her ambition ends in ruin as the two kings war with each other. The third lord (Brice), a loyal physician is finally rewarded by pairing up with the deposed queen. Costumes, sets, and such props as the royal barge are convincing with colorful period detail and Cristal is lovely, as usual.